Built for functionality in our nearby factory, Westside Branch Concrete Vent Blocks offered by Atlantic Coast Precast can influence the visual appeal of your space, too. Our professionals work closely with designers, engineers, architects, contractors and other industry professionals to cast custom vent blocks made from unique samples, specifications, drawings, and sketches. 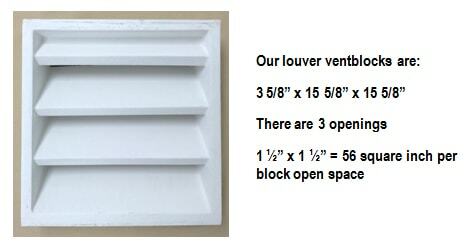 With decades of experience, we can help you choose personalized vent blocks for your next project. Popular in the 1950s and 60s, vent blocks, also called pattern blocks or breeze blocks have begun to come back into style for many residential and commercial spaces. This is because our two-piece blocks are naturally cooling. They allow light and fresh air to pass through while cutting heavy winds, blocking debris, and keeping moisture out. Not only can our Westside Branch concrete vent blocks create a bold visual effect, but they will also offer enhanced privacy for residents. When moisture becomes trapped in your crawlspace, foundation, warehouse, or any other indoor space mold, mildew, damp rot, and termites. Our Westside Branch concrete vent blocks can allow trapped moisture to escape, naturally circulating air. Atlantic Coast Precast can also source your decorative louvers, which arrive in a single piece and will enhance your space without allowing air to pass freely through. Call for a FREE quote.